Come investigate efficient tools with us for making women's voices heard! The Kota Alliance has the honor of organizing this free parallel event with NGOCSW during the Commission of the Status of Women (CSW62) of UN Women on Wednesday March 21 at 8:30 - 10:00 AM. 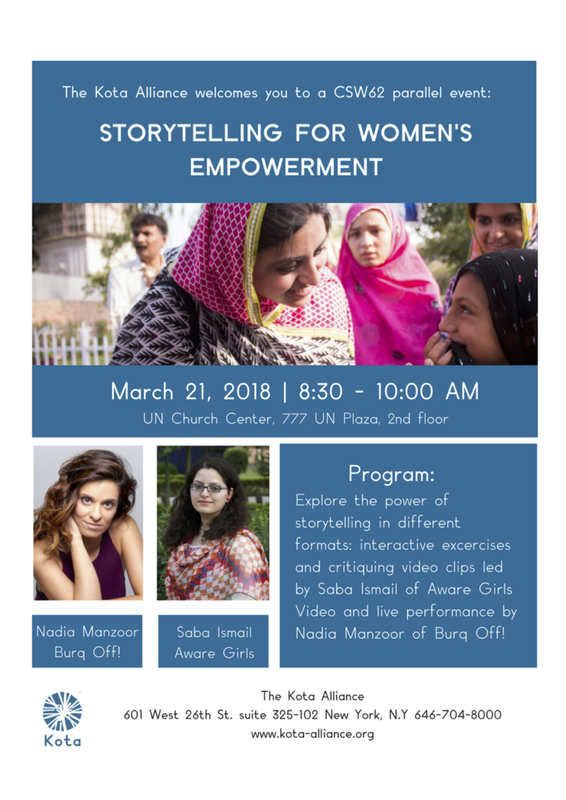 In order to explore the power of storytelling in different formats, we will review stories on video and engage in interactive exercises with Saba Ismail of Aware Girls, followed by a presenation, including a live performance by Nadia Manzoor of Burq Off! Everybody are welcome to join this free event and you do not need to have a UN grounds pass to enter.